When you can’t go to the grocery store, growing food is your only option if you want to eat. In northern Uganda, refugee families from South Sudan face this harsh reality daily and have turned to Food for the Hungry (FH) for help. Over 880,000 South Sudanese have flooded across the border, according to the UNHCR. They’re running from violence and running toward safety so they can earn a living and provide a future for their children. People from South Sudan have been crossing the border since the mid-1980s, but the recent escalation of the ongoing war has sent families fleeing in droves. Life is hard for the refugees. At the same time, the host communities have their worries. Life in northern Uganda is already tough. How can village life possibly absorb nearly a million people? How can you provide enough food, water, schools, and health care when the system is already overburdened? 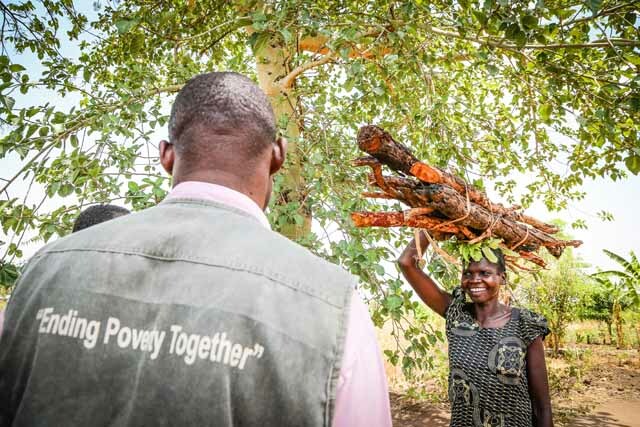 FH has helped families in Uganda’s Adjumani region from farmers' groups of 25-30 households. The groups are a mix of refugee and “host community” dwellers who are already settled in the area. 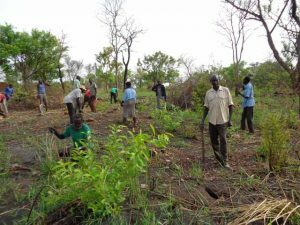 Together, the groups work to clear and plant land that will benefit both refugees and host families. Joseph Kwitino is head of a Ugandan farmers' group formed in November 2016, one of 150 groups FH plans to initiate. The group recently received 10 acres of land from a local landlord, compensated via a separate UN-backed program. But the farmers needed to clear the land before they could plant. “The land was thickly covered by trees and though we were 25 in number [17 refugees and 8 hosts], we only had two axes and three machetes. These tools were inadequate. Therefore, the members had to work in shifts, which delayed the progress of the work. “For instance, we used to only clear an acre in two weeks, working two days per week. But thanks to Food for the Hungry, we now have in total seven axes and 13 machetes. Now all the men are kept busy cutting trees, while the women gather up the cut branches. In addition to tools, the farmers' groups will receive seeds for planting their farms (maize, sesame, groundnuts, and beans). FH’s plan also provides groups with shared access to oxen and plows. And FH is helping farmers market excess produce by improving the infrastructure at local marketplaces. This means farmers will be able to better protect and sell their produce, which contributes to resilience: the ability to withstand shocks like population fluctuation, drought, and other challenges that can hurt children and their families. An important part of community resilience is, of course, caring for the environment. The community is fully aware that tree removal can have disastrous consequences. 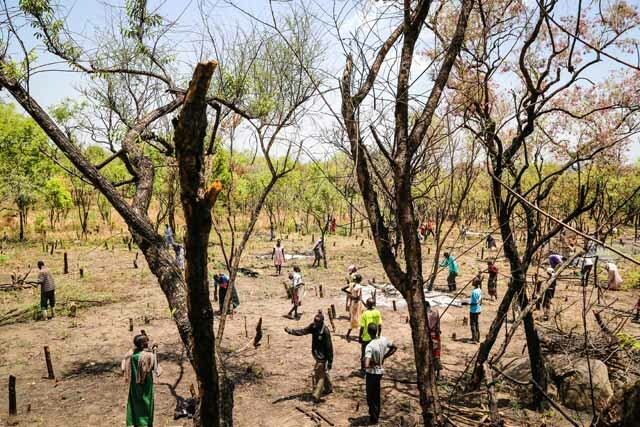 So FH is working alongside the government and other partners to implement tree-planting efforts on non-arable land. 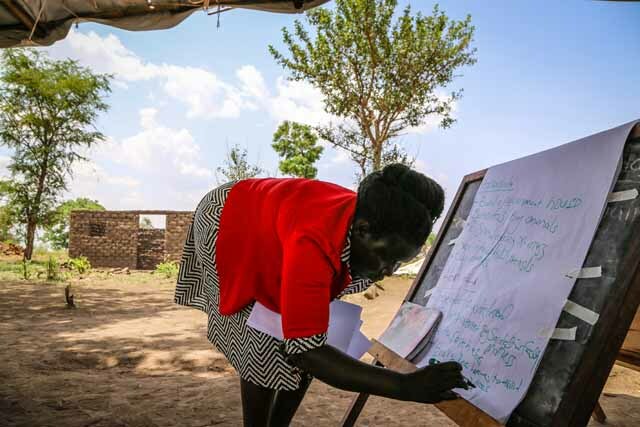 Savings and Loans group training has already started in some of FH’s northern Uganda communities. Priorities include: A permanent home, school fees, and yes, buying Christmas presents. It’s important to realize that 85 percent of the South Sudanese refugee population is comprised of women and children under the age of 17. If you’ve been reading this while picturing male farmers, you should know that throughout the world women often bear the brunt of day-to-day farm work. In this case, men have either been killed in the war or are remaining in South Sudan and making trips every so often to see their families in Uganda. But this society can be unwelcoming to women who attempt to participate fully in farming as a cash generator. Women often participate only in the labour but don’t have control over what happens to the crops — and the cash earned. FH is working to encourage both the farmers' groups and Savings and Loans groups to have at least 60 percent female membership. It’s expected that many of the refugee families will return home to South Sudan eventually, some maybe even within a year. That’s their hope, at least. And whenever they do go, they'll take with them what they learned and will leave their host community neighbours with more food and a better economy. You can join Food for the Hungry in helping South Sudanese refugees who sought shelter in Uganda. Contribute to our emergency respond fund here.